But sometimes, if you're lucky as well as quick, the hours of watching and waiting, the strained necks and the tired eyes, the misidentification of yet another pigeon, are all worth it. Like when I saw a kingfisher (just the common, Eurasian kind) at Rye Meads RSPB reserve, in a hide I had all to myself. The stunning creature, little bigger than a starling but brilliantly colourful and with an astonishing beak, was perched on a stick and modelled for me, his greens and oranges catching the last rays of sunlight, before deciding “That's your lot” and dashing away. The sighting came after a long day of walking and waiting at Rye Meads, and the kingfisher was all I could think of on the way home. It might not have been the case if I'd seen the bird early on, or had seen lots of sightings. In the same way that a pint is most welcome after the hard miles are done, and feels a bit of a cheat at the start, birdwatching is best enjoyed as a form of delayed gratification. Perhaps that's why I felt slightly cheated on a car-free winter walk in Chilterns Country when, about 20 minutes along the way, as I entered the village of Aldbury, I heard the sinister whistle of a red kite, the very bird I had gone on the walk to seek out. Yet, with only around 2,000 breeding pairs in the UK, I couldn't be too disappointed at seeing such a magnificent bird at close range. Fortunately Aldbury is a quiet place, so I could stand in the middle of the road, to the gentle surprise of locals, and say “Wow, wow!” as I turned in circles following the kite's flight above the village, so low that I could clearly make out his features: the flash of white on the wings, the forked tail, the wicked beak. Having ticked off the main thing on my walk to-do list within a mile, I set out to discover the other delights of the north Chiltern hills, taking in part of the National Trust's Ashridge estate. 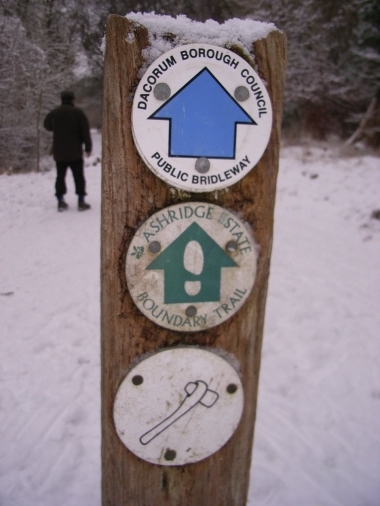 As I began a steep climb, a dog walker warned of enthusiastic sledgers hurtling down the path. Amusing myself with unvoiced 'sledges' of “There's no sleigh big enough for your fat arse”, I dodged the children enjoying the last of the snow and ascended to the Bridgewater monument. This was built in 1832 as a tribute to the third Duke of Bridgewater's work constructing canals (although someone else, with no monument, probably did the actual work). The stretch of grass hosting the monument also has a rather impressive café. The birds certainly thought so: nuthatches, chaffinches and robins joined me at the table while I had a cup of tea and an enormous scone. No doubt calorific crumbs left by café goers are part of the reason the birds there were surviving the winter in rude health. Whether it was because I'd already seen the red kite, or because I took too long over my snack, or perhaps because the going is so much tougher when walking through snow, I decided on the shorter option of the walk (a handy leaflet provides options for four-mile and six-mile walks following old drovers' paths). I was soon slipping and sliding through Aldbury Nowers on my way back to Tring station. But there was one more treat in store: as I emerged through the woods, I surprised a family of wild fallow deer grazing. 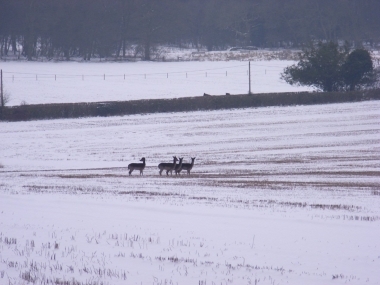 They stared at me; I stared at them, then they lolloped away, unperturbed by the snow, or the stranger in their woods.